Parallel Context: How do Cross-MMO Guilds Work? How do Cross-MMO Guilds Work? 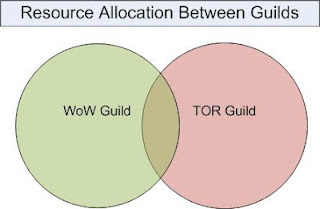 The advent of TOR and the subsequent creation or TOR branches of WoW guilds has gotten me to thinking. How much to the WoW guilds share with their TOR counterparts? Just what is inside that intersecting area? Web sites? Vent/Mumble? Just a spot on a guild’s forums? Nothing at all? The thing I can see is that --even with the best of intentions—the two guilds will grow separate over time. Members may join for one MMO but have no inclination to join the other. 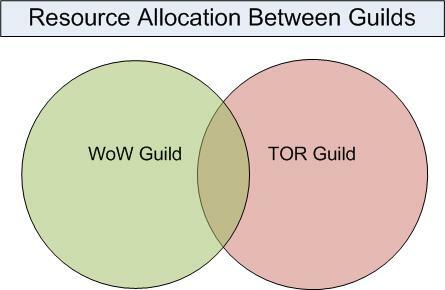 Perhaps a guild may have a rule that only their WoW members are allowed to join the TOR guild, but that will create a subgroup within the larger WoW guild that may eventually seek independence from the larger organization. I’d imagine that the answers are a whole lot of “it depends”, but I’m curious as to how this little social experiment pans out. My guild is a multi-game guild. We have people who play WoW, RIFT, and SWTOR (as well as Minecraft and other things). We have a few folks who just play one game, but for the vast majority of new members one of the big reasons they join us is because we're multi-game. No matter what you play, you know you have nice people to play with (whom you probably already know). Running a multi-game guild requires a little ingenuity. You need places where all players will interact with each other (our forums are super popular with players), group events (TF2 night! ), and other things. For us, the flexibility of playing whatever you like whenever you like and having guildies to do it with outpaces the benefits of being a targeted group. @Liore-- Has your guild always been a multi-game guild, or did it evolve that way? How do you handle the details? What's That About Wrestling With a Pig Again?